Solar Electric Systems - Collins Control & Electric, Inc.
We have designed and installed many custom Solar Electric systems for residential and commercial customers. We offer service for our systems and those installed by others. 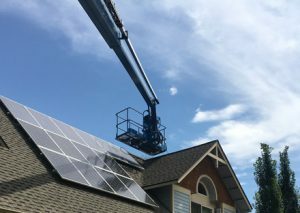 In 2005 CC&E expanded our Fort Collins electrician services and began to design and install Solar Electric Systems, also known as Solar Photovoltaic Systems (PV). 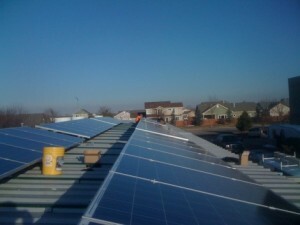 Since then, we have performed many solar installations for our residential and commercial customers. We are capable of designing and building the entire installation including the mechanical and electrical system. We have also partnered well with others on large commercial installations. Our customers appreciate our end-to-end approach in providing fully functional and integrated solar systems. We have seen a number of pure solar companies come and go with the cycles of interest in solar energy. 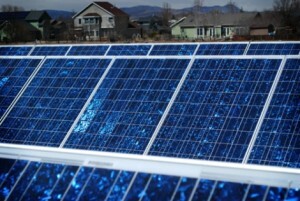 This interest varies with the economics of solar energy against other energy sources – including government incentives. Since our business is more varied, we are available to service your solar system over the years. 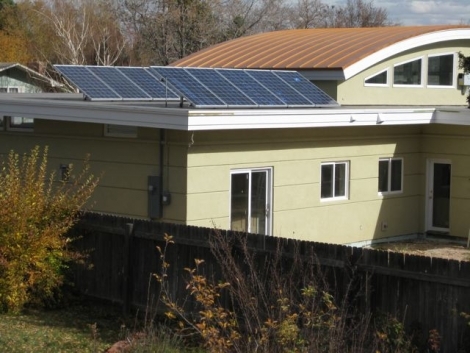 One of our specialties is off-grid residential solar power. These systems use a Photovoltaic (PV) array, to charge a battery bank. An inverter converts this DC power to AC, that can power your home or cabin. These systems can be supplemented with a generator that provides power during the cloudier winter months. Now you can truly live off the grid! We offer these solutions throughout our full service area. With a Grid-Tie solar system, commercial and residential customers will see a lower electric bill from the electric utility. It may be possible for you to send excess power upstream to the power company. You may also be eligible for rebates and incentives. Programs vary by company – contact us for your location. Commercial customers can see major benefits if solar reduces their peak power usage. The idea is that electric utilities have to manage their less expensive coal fired power generation against more expensive but faster to adjust gas generators. For this reason billing is set up to penalize heavy users during the utility peak each month, and those who contribute to the highest facility demand. Learn about a facility demand charge, and a coincident peak for the utility. Visit the Fort Collins Electric Rates for more on rates. Contact us to evaluate how well solar would work for your company. 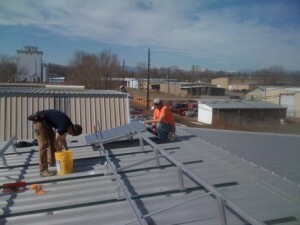 Currently, we offer Grid-Tie solar systems in Fort Collins. We do provide service for solar electric systems in our full service area. Step 1 – Solar site assessment and information gathering. We make a visit to the home or business to determine best placement and orientation of Solar arrays. We also gather historical electricity usage from the customer and determine what motivates their desire to GO Solar! We address budget issues. Unless we’re told a specific system size, we will provide estimates on systems that will produce enough electricity to cover 25%, 50%, 75% and 100% of your needs. We have built systems that produce more than the customer uses in order to get paid for sourcing power to the grid. We will help you determine the best return on investment (ROI) for your needs. You decide what system size you want. CCE provides a firm quote. The system can be one of the estimates provided in step 2 or any other size. Contact us to get started with your solar electric system! Mike Haddorff’s extensive experience with thinking “outside the box” makes him a resourceful and valuable electrical systems assessor. The folks at Collins Control did a fine job installing our PV system. The workmanship at the array as well as the inverter was tight and clean… We’re very happy. 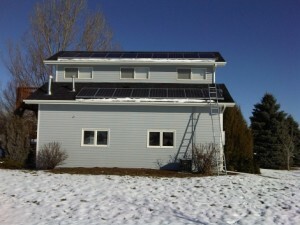 Their willingness to work with us on a non-conventional PV installation was great. Their expertise and professionalism was exactly what we needed. We are 100% satisfied. I would highly recommend them. They are very easy to work with, they are good communicators, between us, their partners, and their crew. I couldn’t speak more highly of them. They were very receptive to input. …It was done with a lot of ownership. The guys were the most congenial and pleasant group of guys I have encountered. They not only did a great job but were enjoyable to have here. I would highly recommend your company in the future.